The Diet Special It took me three or four hours to make lunch. 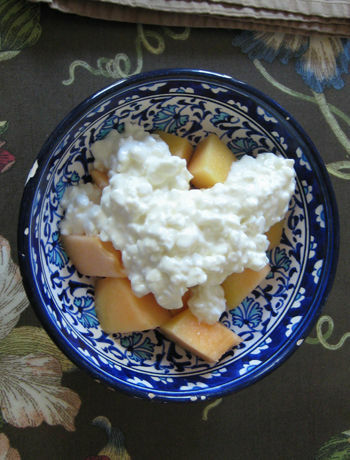 The menu: cantaloupe and cottage cheese, that diner "diet" standby. First, I got out the melon, board and knife. May have even made the first slice with the knife. Then, well, I'm not sure, but it involved crying, nursing, diapers, lulling and bouncing on the yoga ball and getting sleepy, then suddenly crying-nursing-and-more-diapers-and-more-crying. Then I put Leo in the sling and cut the melon haphazardly into random shapes while bouncing around like a 9 month pregnant woman on a long bathroom line. Then I thought he was asleep and attempted to tip him out into the crib. You can probably guess the rest. Anyway, now, finally, I'm scarfing down my light lunch while the baby sits grouchily in the swing deciding whether or not to stand for the abandonment (see photo). Why, oh, why, did I ever take him out of the sling? (Oh right, because it's 97° out). So there you have it, my postpartum weight loss plan: Eat every meal several hours later than I meant to; Bounce, dance or jog-walk around the apartment, block, or park, for most of the daylight hours; Lactate like the life of someone I love unconditionally depends upon it; and sit in my sauna of an apartment dripping sweat to avoid the claustrophobia of the air conditioned bedroom. Will it work? Will I shed the last 10 pounds that are keeping me from fitting in my summer clothes? Once, that question might have mattered a lot. I can remember thinking about appearing in a swimsuit with dread because I was plumper than I liked. I'm at an all-time plump now, but you know, it just doesn't mean the same thing. I may not have brushed my teeth this morning either, and I know for a fact that I forgot to brush my hair, which is actually an improvement on the days when it doesn't occur to me to wonder whether or not I've brushed my hair. My friend Stef was recently reminiscing about a spoof ad on Saturday Night Live for "Mom Jeans" where the camera comes up on a woman from behind as she's unloading her kids and groceries from the minivan. She's wearing jeans with "a 9 inch zipper and comfortable pleats". The slogan: "I'm not a woman anymore, I'm a mom!" Well I'm hoping that when sleep is a more reliable option, and Leo is able to nurse well enough to keep me from wanting to tear out my unbrushed hair, I'll be able to look in the mirror regularly, and work on spiffing up a bit before I run out of the house for my please-go-to-sleep walk around the park. My feelings about myself will never be the same though, I'm pretty sure. Giving birth to Leo has made me realize that before having a child, I was the center of my consciousness, no matter how much I might try to focus on and give to other people. Then, in a strange splintering of the self, as someone who was part of me left my body, the center of my consciousness transferred, became external. I know, Leo will grow up, learn to take care of himself, move out, and probably call less often than I'd like. But I'll never stop feeling proud to be his mom, and that pride brings me a new kind of self-acceptance. I may not be preening much these days, but when I look at my little, thriving, adorable boy, I feel pretty good about myself. Plus, he's a great workout.